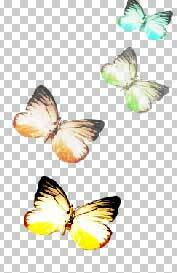 This task we’ll learn how to change the skin’s color, change the objects’ color and brightness, lay over the pictures one above the others, create the tattoo’s effect and imitate the butterfly’s fly. Mark it out along the contour using Polygonal Lasso Tool. Copy it then: Edit ? Copy (ctrl+c) and place it on a new layer using the command Edit ? Paste (ctrl+v). Erase the previous layer clicking on the fast erasing button on the Layers window. Take Smudge Tool, preliminary setting the brush’s hardness on 0% and cover the skin’s birthmarks and unevenness. Make the layer lighter, using the next command Image ? Abjustments ? Desaturate (shift+ctrl+u). It’s necessary to apply a color filter (Image ? Adjustments ? Photo Filter) to give to the skin a nuance. Choose Sepia nuance for this case. Take two pictures, representing the tattoos and place each of them on a new layer. Place them on the girl’s back and change the Layer’s type on Linear Burn. 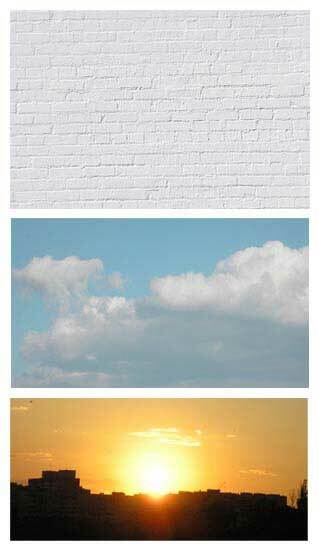 Create the background now. Use three different pictures for it. Take for the beginning a picture, representing a wall and place it on the layer under the girl’s one. Make it look lighter: Image ? Abjustments ? Brightness/Contrast. Place the picture with the sky on the top, using also Filter ? Blur ? Smart Blur, making it look lighter too. 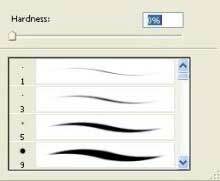 Change the layer’s type on Linear Burn. Place the city’s picture above the sky and the Sun must be situated exactly in the center of the picture. Change the layer’s type on Overlay and minimize the layer’s visibility. Use Ellipse Tool to represent an orange circle, which will be situated behind the girl and will imitate the sun. Apply Filter ? Blur ? Gaussian Blur and chage the layer’s type on Linear Burn. Use the same instrument to draw several circles of different sizes to right side. Apply to them Filter ? Blur ? Gaussian Blur and change the layer’s type on Linear Burn. To make the same circles to the left side, it’s necessary just to copy their layer: Layer ? Duplicate Layer, applying the command Edit ? Transform ? Flip Horizontal. Represent the wings’ shadow now. Copy the layer: Layer ? Duplicate Layer and place it under the girl by clicking on it and moving it, holding the button pressed. Apply Filter ? Blur ? Motion Blur. 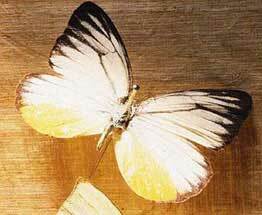 Place the butterfly picture on a new layer. Cut it out using Polygonal Lasso Tool. 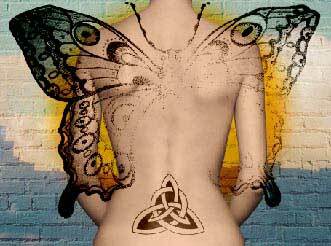 Copy the layer in a way to have finally four butterflies. Using Edit ? 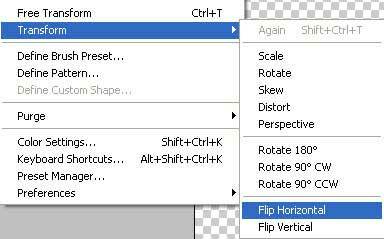 Free Transform (ctrl+t), place them on different angles, highness and different sizes. Copy this layer and apply Edit ? Transform ? Flip Horizontal to place the butterflies to the other side also. Merge these layers (Merge Down (ctrl+e)) and change the layer’s type on Linear Burn. 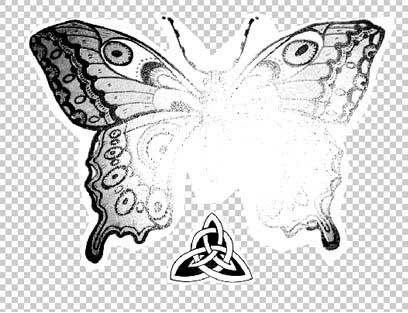 To create the wings’ flap illusion, just copy the layer, representing them and apply to it Filter ? Blur ? 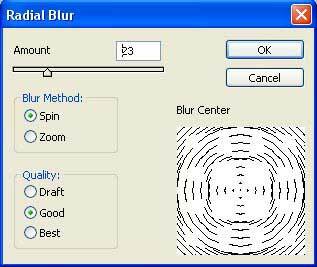 Radial Blur. Make the frame also with Crop и Rectangle Tool.